Reports are a powerful and needed business tool. Our reports are available in our App, go to Extras and then Dashboard. Your user name (the email you used to sign up with) and password is required. Forgot your password, follow reset password blog to reset. Our reports are also available from any computer or phone at manage.datiopos.com. In the upper right you can email the report to yourself or download as an excel file. We have 5 reports. All reports can be shown by Month (last 30 days), Day (today), Week (last 7 days), Year (last 365 days) or select the date Range of your choice. 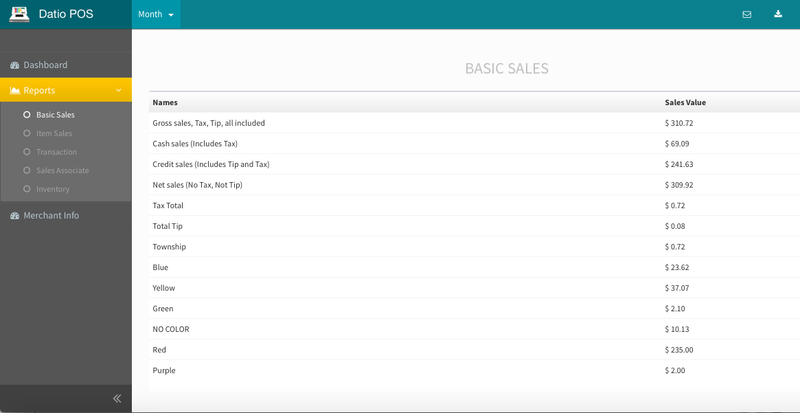 Basic Sales will show you sales by total, cash, credit, your taxes, and sales by color. Item sales will give you a list of all Items, quantity sold, sale amount and color. Transaction report is very detailed to list every sale you completed with many details. 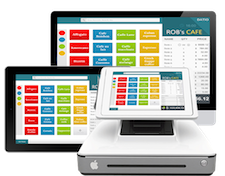 Sales Associate report can help you determine the sales by each of your employees, again remember you can pick anytime period that you are interested in. Inventory report will show you the inventory of each item, quantity sold, threshold for low inventory notification and more. On the bottom of the menu on the left there is a small arrow to hide the menu, it is very helpful when looking at the reports on your phone. Dashboard can give you a quick look at your business, remember to select the time period you are interested in.